Whether at the DMV, the post office, or even an amusement park, everyone knows what it’s like to wait in a line that seems like it’s never going to end. However a lot of the time, the lines in an amusement park have something to set them apart from others—and not just a roller coaster at the end. 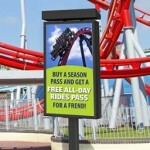 Many waiting areas for amusement park rides come complete with, you guessed it, digital signage. If you’ve experienced this, you’ll know how it can make the wait seem shorter. If that’s not enough for you, a new survey by Millward Brown found that 84% of customers feel that the presence of digital signage while they’re waiting in line makes the wait less annoying. Of course, you want to work to keep wait times low but there’s often some amount of time that can’t be avoided, and when you’ve done all you can to decrease the time customers spend in line, you still want to work to improve their experience. The installation of new digital signage can really improve customers’ impression of your business. When developing content to be delivered to people waiting in line most companies like to use their digital signage for a dual purpose: entertainment and advertisement. While you have your customers’ attention, of course you want to advertise to them. Additionally, selling ad space to other companies can help defray the cost of digital signage installation and upkeep. A similar tactic has been picked up by movie theaters, which noticed that when moviegoers show up early to a movie, they tend to be staring at a blank screen—and replacing that with advertisements could be lucrative. Additionally, it’s imperative to make sure that there is enough content to entertain a customer throughout typical wait time. If customers wait in line for 20 minutes, but there’s only 5 minutes’ worth of content on the screen, the customer is likely to come away more annoyed than if there had been nothing at all. An ad that’s entertaining the first time can become the bane of your existence when it’s played four times in a row. As with all digital signage strategies, proper implementation is the key. Give your customers something to enjoy while they wait!